It was so good to be a the shop on Saturday, to see friends, and immerse myself in sparkly things! I have another custom order for a coworker that is my favourite kind, because they have given me a set of criteria, but nothing specific. So I get to use my imagination and come up with something that fits. I also fell in love with a combination of pale blue cloisonné beads and robin’s egg opaque Chinese crystals, I have been eyeing these particular crystals for weeks, but it wasn’t until I spotted the cloisonné that I could resist no longer. I am picturing a princess length necklace of alternating cloisonné and crystals. I don’t know if anyone else has this issue, but I have to admit that after a flurry of crafting and then nothing happening for a while, I find that I need to completely inventory and reorganize my supplies. I couldn’t tell you if I have any 7mm silver plate jump rings, and for a chain maille addict, this is simply unacceptable! So sometime this week, I am going to have to go down to my crafty cave and figure out what is what! I also get an inordinate amount of enjoyment just from organizing things…that can’t be normal. Perhaps it is my love of the act of creation, that has caused me to be also distracted by my vegetable garden. it started as a big rectangle of dirt and now it is a bounty of potential tomatoes, zucchini’s, herbs and lettuces. There would be peas too if the dang local bunnies would leave them be. But I digress! wait…where was I? Creating, that was it! I think I was attempting to draw a creative comparison between gardening, jewellery creation and my tentative steps into writing. Betta and Annalea would still like me to tell their story, so with some help from Julie at Word Flows I am going to try to actually write a story! But back to jewellery, I will be working on those two projects this week so my next post will have pictures of sparkly things. as well as making HUGE strides with my chevron! You remember my chevron don’t you? No? well, that isn’t surprising since I tucked it away and haven’t touched it since the fall. However, I am happy to announce that it is now 3/4 of the way through! When I do finally get this finished, I am going to make it into a bib type necklace. I will probably do other versions at some point, but probably on a smaller scale. It amazes me (and my writer friends will definitely be able to relate) how a project that in your head was something totally different and MUCH smaller, completely runs away with you and ends up being something that has more than a thousand jump rings in it and took almost 50 hours. It’s a labour of love! Lots more to come over the next few weeks as I prep for my open house and sale next Sunday, the 29th! This goes back to what I was saying the other post about being inspired by a particular piece. 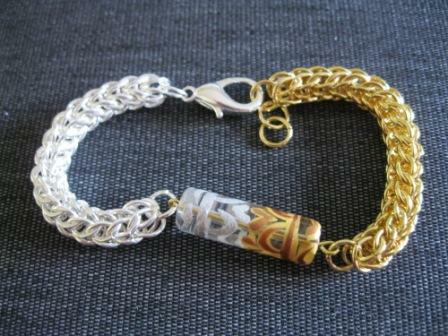 I found this one bead at a local shop and immediately new that whatever I made, half had to be silver and half gold! So what I decided on was the full Persian because it makes such a wonderfully sturdy rope-like piece! The only thing I am not completely happy with is that I couldn’t find an eye pin that is half gold and half silver, but still, it’s pretty nifty. I did a little more work on my story the other day was well, but, I realized that like my friend at Word Flows was saying the other day, I need to set out the outline of the story before I write too much more, because otherwise, it won’t end up getting anywhere. 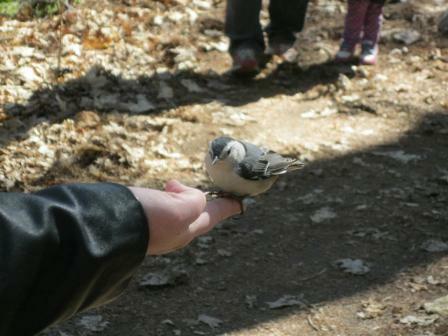 In my defense, I spent Friday hiking and feeding Chickadees and a Nut Hatch by hand! So during a slow moment the other day I thought I might give writing a try. I have always dabbled in it, and have produced a few little pieces of things here and there, but I lack any sort of discipline to finish anything. Still I started a little bit of something about a Bear named Betta and a little girl named Analea and a Rescue Mission. Oh what the heck, here is a snippet of the story..
Betta stared out across the moonlit valley, deceptively calm and innocent looking. It was just an illusion though, that Betta was sure of as her amber eyes scanned the blue tinted emptiness. She would have much preferred to stick to the woods, terrain she knew and could work with. The valley floor was barren of growth except for the short brittle shrubs that popped up here and there. They were no good for cover though as each one was inhabited by massive venomous spiders that hunted for, well, anything they wanted really. Though their venom wasn’t fatal to anyone Betta’s size, it would certainly knock her out for a while and Analea wouldn’t stand a chance, besides, they gave her the creeps. So without being able to use the shrubs as cover, it meant travelling out in the open, and being constantly visible to the Hoarders. ‘That’s assuming anyone made it out of the asylum to be watching for us’, she thought hopefully as she picked a fishbone out from between her teeth with an inch long razor-like claw. Standing up she turned back towards the woods and sniffed, her long snout twitching with the familiar scents of pine and leaf mould. Nothing alarming came back to her on the night wind. If they were following, it would be a while before they caught up, and by then they could be half way to the mountains. She would have to continue to carry the child, there was no question that she could make the journey after so many month’s confined.